Pastoral communities are facing increasing pressure on their livehoods due to depletion and degradation of their productive resources. Land tenure plays a decisive role in sustaining pastoral productive systems. However, these communities are also facing pressures on their land as a result of misconceptions about pastoralism, changing demographics, urbanisation, climate change, and environmental degradation. In addition, public policy has not always favoured the development of pastoralism. Instead, public policies has promoted individualisation of land tenure. Individual land tenure is inconsistent with the sustainability of pastoral productive systems as it does not support sustainable practices such as mobility. On the other hand, these practices are supported under collective land tenure. 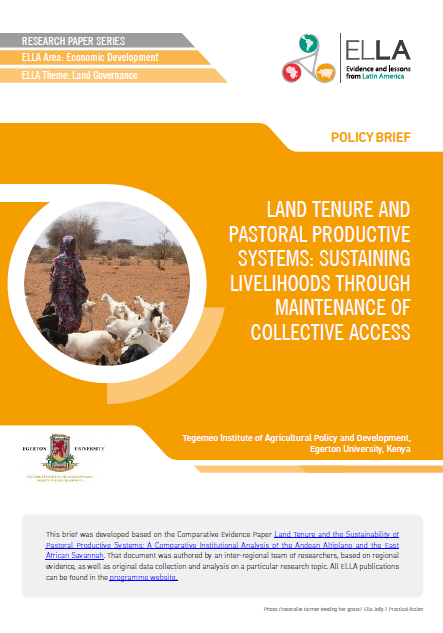 Given that pastoral communities reside in areas characterised by arid and semi-arid conditions, and where alternative uses of land such as crop farming may not be possible, this policy brief argues for the maintenance of collective land tenure as it enhances the sustainability of pastoral productive systems. Public policy should be re-oriented to help pastoralist communities maintain collective land tenure regimes since these are likely to sustain pastoralism especially in the arid and semi-arid areas where alternative economic practices are not easily feasible. This can be achieved by promoting policies that focus on formalisation of land tenure rather than the individualisation of land tenure. Local and customary institutions for land management and governance should be strengthened. As part of strengthening customary institutions, formal recognition of customary rules in the country’s legal system will strengthen the enforcement of customary laws pertaining to land and resource management. Further, territorial rights can be allocated to communities in un-adjudicated pastoral land. Pastoral communities also need to be sensitized about herd size management. Mobility on its own will not lead to sustainability of these systems because pressure on natural resources will continue to increase with increase in population.